You all may remember my post earlier in the week with my Spring Stripes nails. 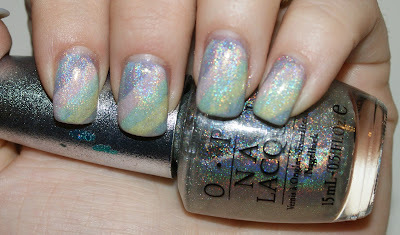 Well, for hump day holo (at least, this belated one), I wanted to see how I can kick it up a notch! Behold - Holofied Spring Stripes! I LOVED it! Still girly, but delicate and yet it has the KAPOW I wanted! So tell me, everyone... which look do you prefer? The original Spring Stripes or the holofied Spring Stripes? Way cool! I like both for different reasons: the original has really nice color definition; and the holo version blends everything together for a misty day rainbow effect. So pretty!